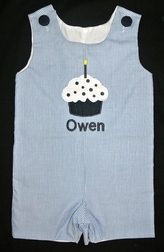 Caroline Bradlee Designs > BIRTHDAYS > BOYS > Boy's Birthday Cupcake John John Outfit. 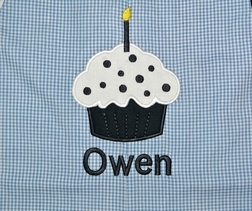 Wonderful little gingham birthday John John or longall for the little prince! The front of the outfit is decorated with one cupcake, and your choice of number of candles. Your little one's name can go under the cupcake to make it more personal.